Thaw the hashbrowns and drain any excess moisture. Press paper towel to them to make sure they are good and dry. Melt the butter and mix with the hashbrowns, then pour them into a pie plate. Press them into the plate so that the hashbrowns start to come up the sides and form a crust. Place in hot oven and bake for 20-25 minutes until they start to get slightly browned. While the hashbrown crust is baking whisk together the eggs, milk and salt and pepper to taste. Add the ham, veggies and cheese. 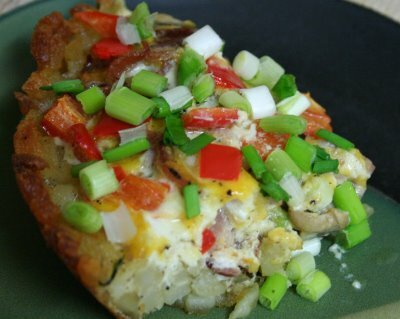 When the hashbrown crust has finished baking, pour the egg mixture into the crust. Lower oven temperature to 350 degrees and bake for about 30-35 minutes or until the egg puffs up and is no longer runny and jiggly in the middle.